"8 Bottles on a single level"
This is the newest addition to our bar light line. 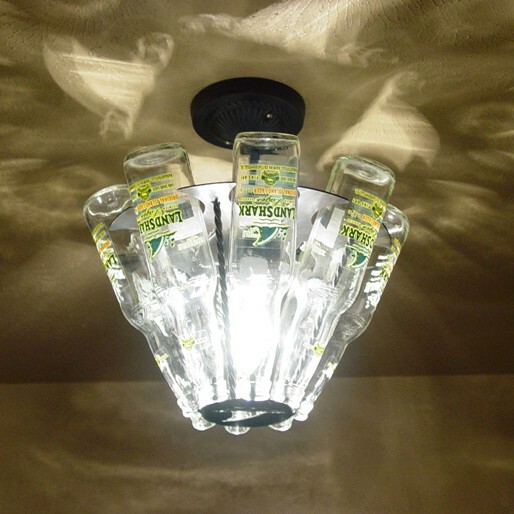 It hangs from the ceiling only 12" and holds 8 bottles. It is constructed of 14 GA steel and we incorporated decorative "twisted wire" as spacers. It is offered in 2 finishes as well as 3 themes (shark fins, stars and sea turtles). Great for a retrofit (replacing an existing light fixture with this one). The light bulb and bottles are not included.